Getting to Martha’s Vineyard Island is always a challenge. Traffic, ferry reservations, the lines for the ferry and then more traffic. It does not have to be that bad. If you allow some time and do some planning you can enjoy the journey. Make your plans early. Get Ferry Reservations as soon as they are available in January of each year. You can do it all on island without a car. Many of our guests come to the island without a car. We are in town and easy walking distance to everything in Edgartown. There are plenty of cabs that come when they are called and they use 12-15 passenger vans for the most part. The MV bus system is really good and a short walk from the house. 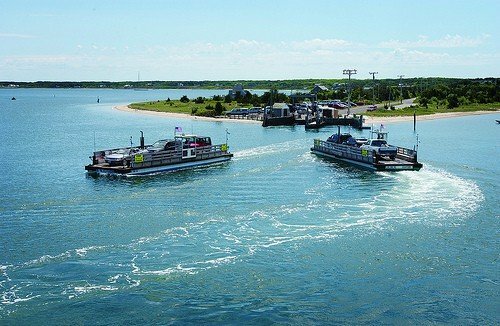 The cost and hassle of taking a car to the island through the Steamship authority (the only way to do it) is often way more than taking a cab anywhere you want to go (rainy day in Oak Bluffs, grocery shopping etc., out to a bar.) If you have to have your car then there is no substitute for making early ferry reservations on the Steamship Authority website. Take the time to make an online account and do it that way. Waiting on the phone is normally torture. If you have to do errands do them EARLY in the morning. If you decide to leave the car there are at least five other additional ways to get to the island. I prefer the Falmouth Edgartown Ferry especially if my travel plans can avoid Cape traffic (thickest on Friday and Sunday Evenings). The “Pied Piper” offers valet parking. On arrival they come in at the Edgartown Town Dock. From there the Captain Morse House is only two blocks away and an easy walk. We have a garden cart to carry luggage in the tool shed or a cab is easy to get . When you are ready to leave the Ferry takes you back to Falmouth and your car is ready and waiting for you. This is by far the most relaxing and fun way to go. If you want to cut out the trip to Falmouth, especially if you are coming from Connecticut or New York then consider either the Sea Streak (was the NE Fast Ferry) from New Bedford or the Vineyard Fast Ferry from Quonset Point in Rhode Island. The disadvantage is the parking is a bit harder (drop off bags first) and you are let off in either Oak Bluffs or Vineyard Haven rather than in Edgartown. The ride from Quonset can be rough so mind the weather. New service since 2009 is the NE Fast Ferry service from New Jersey and New York. This is the ultimate way to travel to the island especially if you live in the city. Reservations are highly recommended. For folks who want to travel by Air there are several that service the island. The price is reasonable and will allow connections from other parts of the country. Again once on island you will really not miss a car. There are some connections available through Cape Air and even direct flights though various carriers. The traveller should keep in mind that the cost is quite high and fog or bad weather will ground planes into MV. The ferries almost always run. Travel by air is best through Logan Airport in Boston Mass with subsequent transportation to one of three ferries that leave from Falmouth or Woods Hole. From Logan there is a Peter Pan bus to Woods Hole that runs about $30 per person. A better solution, especially for a group, is a private limo or van depending on how many are ready for pickup. I have called and gotten some quotes which appear below. There is no easy bus from TF Green but you can get a limo. The most fun trip is via this ferry which drops you within walking distance of the house. Click here to make a reservation. They use Dockwa which has terrific customer support. Mention code “CMH” for Captain Morse House and receive a 10% discount on your fare. Green Vehicles handle up to 10 passengers + luggage available. Tip is not included. The discussion here is for travel from Charlotte NC to Woods Hole MA. Since this start point is fairly far west you have a choice of going up 81 or 95. There is a lot of construction on route 95 at all times of the day so 81 would seem to me to be the easiest route. This ALL depends on your ferry reservations which should be made ASAP if you have not already done so. OPTION ONE – Traveling on a Saturday with a stop before NY City ————————————————————————————— We have stopped at the Meadowlands / Secaucus in New Jersey the last few trips I have done. Make sure you ask what conventions or games are in the area as this could cause some congestion. This can be risky if there is traffic in the morning going through NY City so a weekday trip past the city would require extra time. An alternative is to go North to 87 over the Tappan Zee Bridge – less congestion and chance of being stopped in traffic. This will need to be manually planned. Nicer Holiday Inn hotel we like a lot. If you have an early boat I would suggest a stop in Essex or Mystic CT which is 11.5-12.5 hours from Charlotte. This means you need to leave Essex 3.5 to 4 hours before your scheduled boat. They want you there 1 hour before departure. My Favorite spot, which is both gorgeous and historic, is the Griswold Inn in Essex. Of course this is the best choice if you have some time. There are also fine hotels in the area nearby. Simply Google them. Another good spot to stop is Mystic which is actually worth a visit if you have the time. Mystic Seaport and the Mystic Aquarium are excellent stops for one and old. If you want to overnight before taking a boat I suggest the Coonamessett Inn in Falmouth for a unique experience. There are MANY ways to do this. The trick is to allow plenty of time for the journey so that it is an adventure and not a forced march. You are going to end up on route 95 eventually so the only real decision is taking the George Washington Bridge or 87 over the Tappan Zee Bridge. Again the GW can be risky if there is traffic in the morning going through NY City. A weekday trip past the city will require extra time. The default route will take you over the “George Washington Bridge”. There is a lot of construction on route 95 at all times of the day so 81 would seem to me to be the easiest route. See my suggested stopping spots above. From Boston or Syracuse NY the routes are fairly obvious. They will all eventually put you onto 28-S. The trick is to avoid the flood of cars going on to the cape on Friday and off of the Cape on Sunday. If traffic is thick consider stopping for a bite to eat. The Western Bourne Bridge is always the better choice than the Eastern Sagamore Bridge. I also tend to like the southern road along the canal when heading north and the northern road along the canal when heading south.